This is the day. 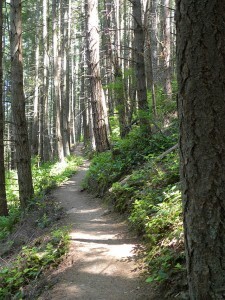 The day that I envisioned reaching the Pacific Northwest Trail. My original look at the picture on the Wikipedia page made me feel like it a was a path I could actually get through on my bicycle. Below picture is not mine, but from Wikipedia. And so I’m really looking forward to beginning this part of the trek as I set out today. I was slightly hoping to reach Strawberry Point campground for my birthday, but was very careful not to specifically ask the universe for this as a birthday present. It was more about wishing for a fantastic day. Heading north on the 101 has dozens of beautiful opening views out to the ocean to the left. 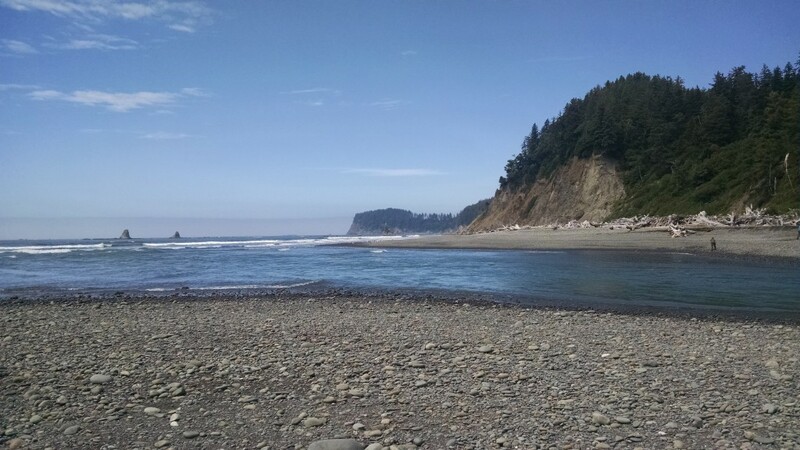 And just before the 101 turns eastward and inland, you reach Ruby beach. It’s a rather touristy area with lots of people, but it’s an absolutely beautiful place to stop and explore. But I’ve got a lot of ground to cover today, as I want to hit the trail head and get into a good secluded camping area. So I only stay long enough for a quick picture or two and head on inland on the 101. 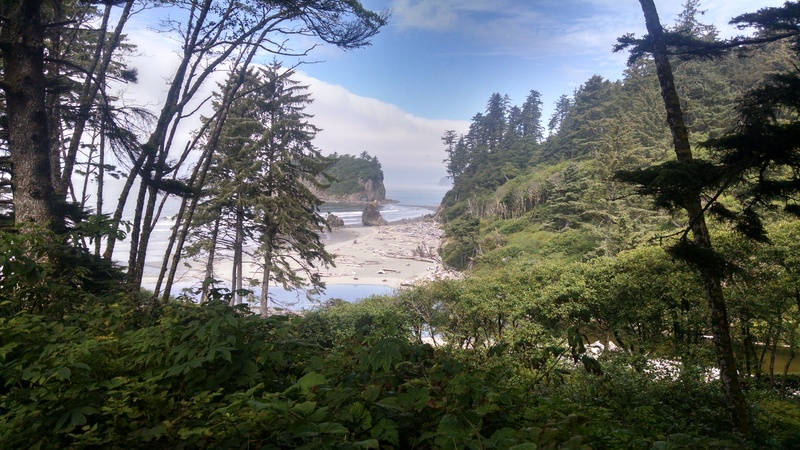 Reaching the mouth of the Hoh River was pretty exciting. I could see backpackers on the north side of the river, and there was even a bike out on the beach as I approached the mouth of the river. 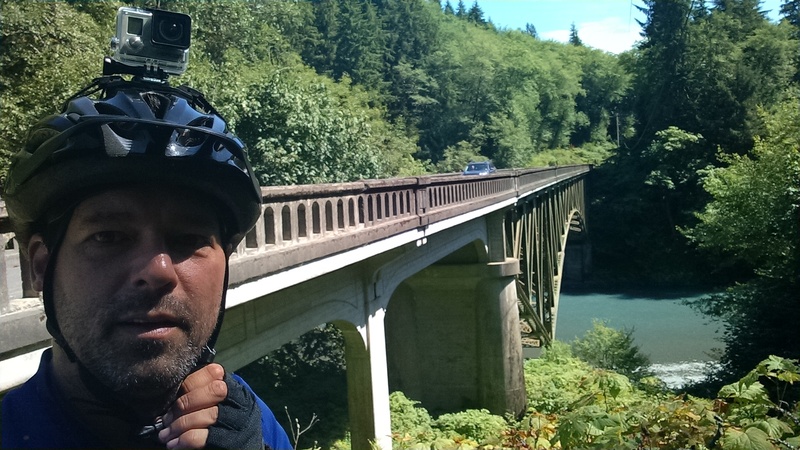 And I was excited even after the moment I met that local cyclist who immediately said there’s simply no way to get across the Hoh river with my bicycle. 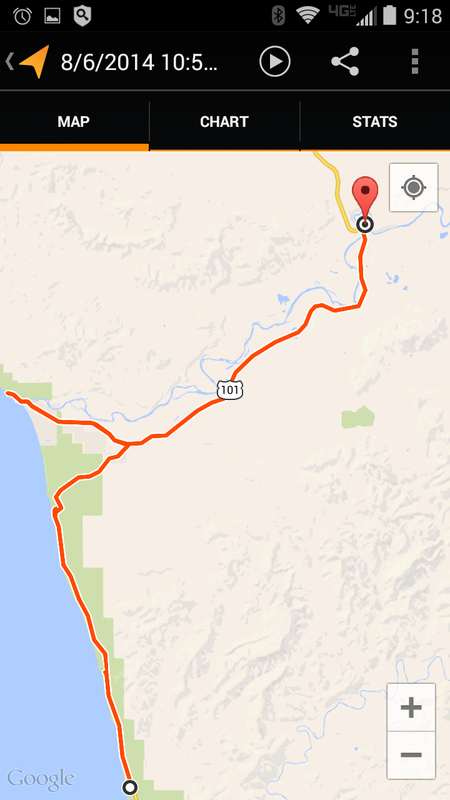 I would definitely need to return to the 101 and go to the bridge that is a good 11 miles away from the river mouth. After all, I knew this was a serious possibility. That I’d have to backtrack and take the long way to get onto the Pacific Northwest Trail. I was completely okay with having to do this. 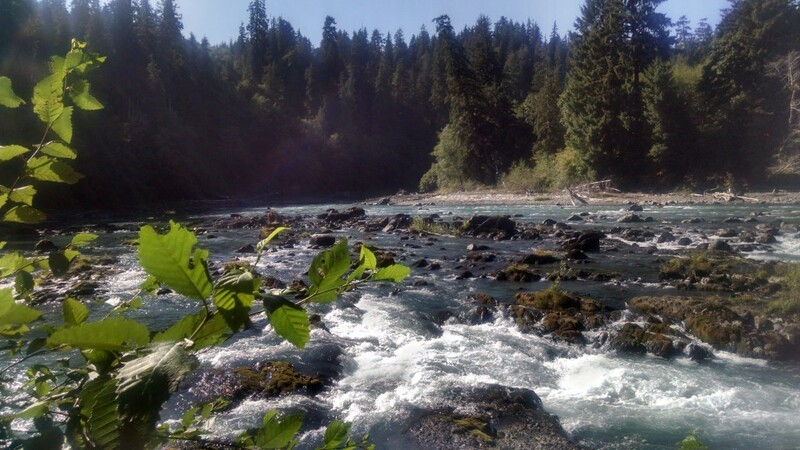 And as I explored the mouth the Hoh River, I could see that he was indeed correct. The river crossing was extremely narrow and extremely violent/fast, and it was deep too. It poured out directly into the ocean waves, and I could tell there would be an undertow even though it wasn’t obviously visible. Crossing the river here would be extremely dangerous and foolish to even attempt it. Perhaps a few hundred yards up from the mouth it would be possible to swim across safely, but not with the bike and all my gear. It just wasn’t a reasonable possibility. The picture below does not properly illustrate how dangerous this area actually looks. The depth drops off almost immediately where you see the water in the picture below. So I decided to take a short rest here before heading back to the 101. 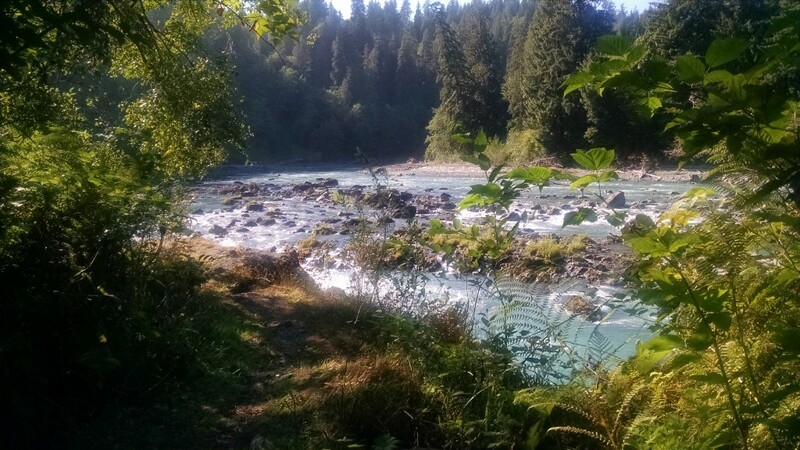 Also while resting here at the mouth of the Hoh River, I can see the backpackers across the way hiking on what appears to be the Pacific Northwest Trail. And at this point, the trail appears to be the beach coast line, and not an actual path at all. I can see that the trail is entirely impassible by bike. It’s just not anything like the Wikipedia picture of the trail. And why would it be, consider how long the tail actually stretches across Washington. This is just one little section of the trail. So I make the decision that I will alter my path entirely. 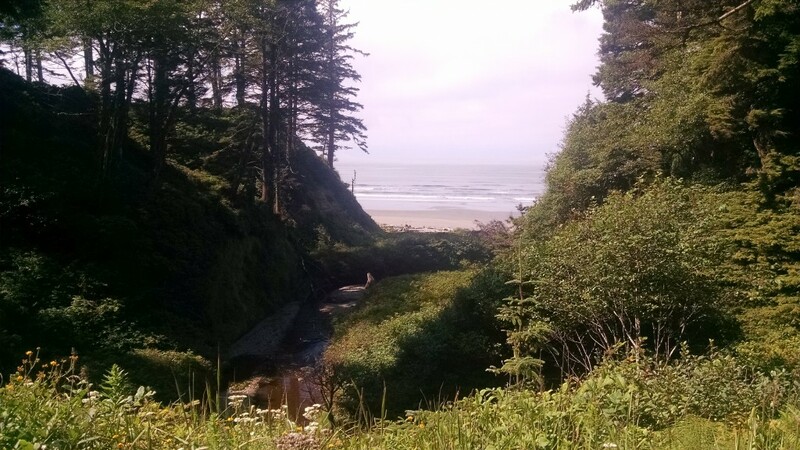 I no longer plan to take this trail along the coast. I will instead head inbound and alter my path in some other direction. 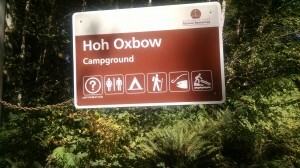 When I reach the Hoh River again, about 11 miles from the mouth, I come across the Hoh Oxbow camping area, which appears to be a first come first serve camping area. 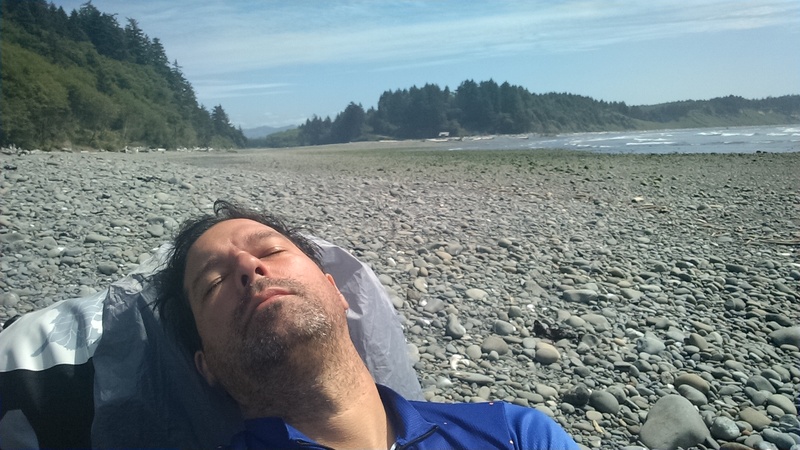 It’s now about 3:30pm, and considering that the Kalaloch campground was full and not accepting new campers, I’d better start doing a little research about where I’m going to sleep tonight before moving on from this possible stop location. What I discover in making phone calls to five separate hotels in the city of Forks, is that Forks is apparently a popular tourist destination. All five hotels are completely booked for the evening, and I didn’t bother calling the one with a 1.5 star rating. I wonder if the no vacancy on a Wednesday in Forks has anything to do with the popularity of the Twilight book series by Stephanie Meyer. My last call for the evening is to the reservation system for Hoh Oxbow, which indicates it is first come first serve, and I should just see if there’s a place to camp. So I head on in. You know how when you’re going to the bathroom where there’s a handicap stall? If all the other stalls are occupied, but there’s no one around and the handicap stall is open it’s okay to use the handicap stall? Well, at least that’s how I see such a situation. However, when you’re in a full parking lot where’s there’s an open handicap parking spot you are under no circumstances supposed to park in that handicap spot. You will be ticketed, and it’s just plain rude to park there. Well, when I first arrive at Hoh Oxbow, and noting that all sites are taken except the handicap site, I envision this like the bathroom stall and decide that I have been lucky to find the last available site at this camping area. And it’s not until my tent is setup and I’m relaxed and walking around that I suddenly see this the same way as I see the handicap parking spot, and I immediately feel like I’ve violated some law, and I’m a really rude and bad person for doing this. The feeling doesn’t last long though. 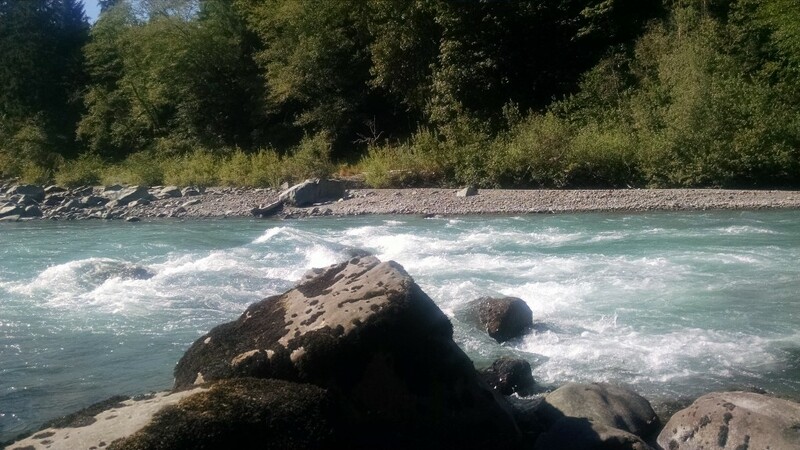 The beauty of the Hoh river washes all doubt away, and I am thankful for having a camping site without a reservation. I drape myself over the rock below and rest by the raging river for about and hour. I post the following picture to Facebook, thanking all those for sending birthday wishes throughout the day. But I don’t take the time to read any of them. I’m mostly in disconnected mode at this point, but want to at least show where I am on my birthday, and that all is wonderful. Not far from the below location, I setup my little propane cooker and prepare my dehydrated backpacking food for dinner. Here is my path summary for Day 6. 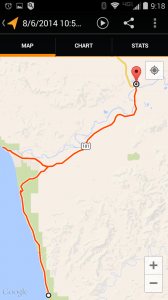 For a link to the raw GPS map, click here.